The technology and design of football goals and nets has significantly improved over the last 50 years. Some of this change is as subtle as it's possible to be. This is our nine-point plan on how an elite level football goal is put together… ready for Harry Kane to drill one in from 25 yards. Football goals have evolved a lot since they were first conceived back in 1848, which is why the current world-class goals can't be just thrown together with a few bits of timber. There's a plan to follow, drawings to match and teams of skilled people able to manufacture, install and of course, check the operatives also ensure every piece of material passes British Standards. The goal frame is the obvious starting point and while steel remains a common material, it's aluminium that you will see at top-class venues – 102mm x 112mm reinforced aluminium. You won't see any wood posts. The posts are cut to length using precision tools, drilled and mitred – providing the angle to make the goal frame. That all happens in the cutting shop. The crossbar is given the same cutting and drilling treatment as the uprights, before elbow pieces are welded on to either end – designed to allow the crossbar to sit securely on its posts. But you won't see those joins because if you can see them, the ball can feel them. The welding continues, preparing the posts for zinc-plated sockets and netting attachments, steel bolts and anything else needed in the design. The chemical degreasing plant is calling. A six-stage process to clean the metal takes it through six separate tanks, and includes the aluminium being zinc or iron-phosphated to stop it corroding. This takes 45 minutes. Free from grease or dirt and with less chance of corrosion, passing its latest set of quality checks, the goal posts are moved to the spray line. It takes another 45 minutes for the white polyester powder coating to be applied, and the confusing 'woodwork' is starting to look fit for Wembley. Arguably the one thing that makes a top-class goal stand out, is its pristine white net. It comes in different thicknesses, generally from 2.5mm to 4mm with braided polyethylene nets effectively ruling out the ball slipping through its holes. A selvage machine and some hand-sewing ensure the net is finished and ready for its goalposts. Long gone are the days of dangerous metal cup hooks and stepladders trying to make sure the net stays in place. Now you will find channels along the back of the goal frame and a run of plastic clips that twist so they lock in their location. Clive Allen's superb free-kick for Crystal Palace at Coventry back in 1980 was ruled out because the referee thought it came back out off the post – when in fact, it hit the back support of the goal that was suspending the net. Since then, football has found its solution. Poles some way back from the goal-line carry ropes that suspend the net, meaning nothing can interfere with the ball in the goal. It may look like the perfect solution, but design teams are currently looking at ways of making further improvements – they just haven't found them yet. For goal posts, think fence posts. Sockets are concreted into the ground, while little wedges ensure there is no movement from the frame at ground level. Each post has an adjustable foot, to make sure the exact height for the goal can be found. 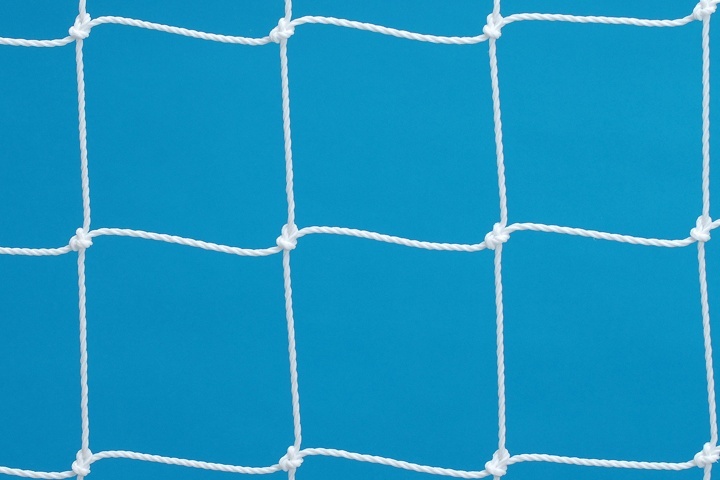 As for the back of the goal, the net is either threaded through or clipped to metal tubing that is secured to the ground. After all, you don't want the ball creeping through the back of the net. And away you go. An elite goal for your elite technique.